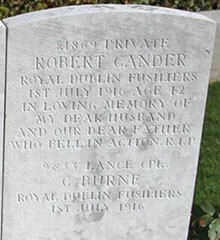 Robert was the son of Joseph and Ellen Cander. Robert was born at Clare, Kildress, Cookstown about 1874. In 1888 the family moved to Scotland. For a time Robert worked in the coal mines. Robert married Catherine McGrath in 1900 in Scotland. They had seven children. 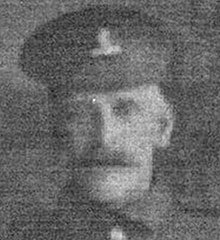 Robert re-enlisted in Hamilton in Scotland Private Robert Cander was serving with the 1st Battalion of the Royal Dublin Fusiliers when he was killed in action on the first day of the Battle of the Somme on Saturday 1st July 1916. Auchonvillers is approximately 20 Kms south of Arras. Using the D919 from Arras to Amiens you will drive through the villages of Bucquoy, Puisieux then Serre-les-Puisieux. On leaving Serre-les-Puisieux, 3 Kms further along the D919, turn left following the signs for Auchonvillers. At the crossroads in the village centre follow the CWGC signs for Auchonvillers Military Cemetery which is on the outskirts of the village on the right hand side.